Dorm Co. Tip: Bed Risers must be square to fit dorm style beds! In a small dorm room, every inch counts! That space under your dorm bed will be the best storage space available. Your college closet will be filled with clothes and shoes, leaving that under-bed space as the prime area for storing your dorm products. You won't be using all your college stuff every day. In fact, some of it will spend most of its time in storage. Extra twin xl blankets, for example, won't be used all year. When they're not in use, they can be kept in dorm storage bins and placed under your bed. Or, if you have a fan for your dorm, where will you place it in the winter? How about under your bed. 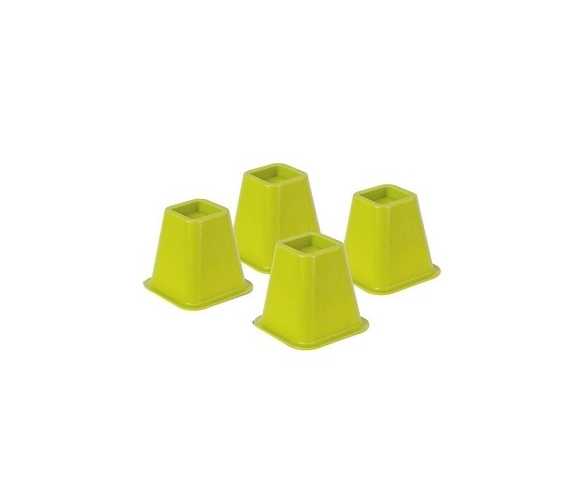 You'll only fit a large amount of supplies for college underneath there if you have bed risers like these Colored Bed Risers - Lime to give your bed a boost! Bed risers for college are downright smart college items to include. With the added height, you can even fit a small dorm room shelf down there. You might be used to throwing dirty clothes and other discarded items under you bed back home. But in a dorm room, that under-bed space is too valuable to be wasted. It's also too valuable to not be used to the full degree! No matter if your dorm bed is placed on the highest setting, you'll never achieve maximum space without some bed risers for college dorm beds. Dorm rooms are too small to let space go to waste!